Double X Science: Xplainer: How do you date a pregnancy? In the first case-based class of medical school, students are asked to answer a virtual patient’s question about the development of the fetus. These students are smart and they know all about betaHcG and are anxious to showcase their knowledge of the menstrual cycle with fluctuating levels of various hormones (FSH, progesterone, etc.). 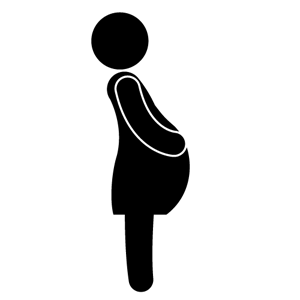 Yet one question brings confusion, “How pregnant is this woman?” The related question, "When does pregnancy start?” leaves the students flummoxed. Is it at conception? But how do you know when that happens? Or does implantation make more sense? It’s a great example of how detailed facts need the larger context. The usual dating is gestational age, based on the first day of your last menstrual period. However, you can also date a pregnancy with embryological age, starting at conception. But why are there two types of dates? We might need a bit of a primer on the menstrual cycle and how it relates to pregnancy. 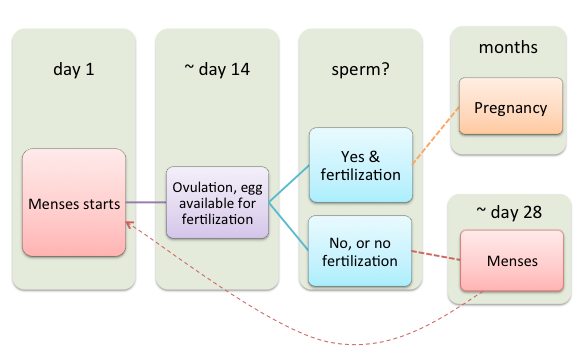 Implantation happens between days 20 and 22. Pregnancy is often detected after the first missed period. This graphic is intentionally simple, removing all the hormones and other fun stuff (Ed: which you can find here). You’ll note that it says approximately day 14 and day 28. In textbooks, we often see that women have 28-day cycles and everything has a nice schedule. However, women are not textbooks and sometimes have shorter or longer cycles and/or have ovulation at slightly different times. Therefore, knowing when fertilization and conception happen can be a bit tricky. An obvious marker is the first day of the last menstrual period (LMP). Why the last day? Well, another variable is the length of menses but everyone has a first day so to be consistent, that is the marker used. We generally use gestational age when discussing pregnancy. So when someone says that they are 8 weeks pregnant, they mean it has been 8 weeks since the first day of the LMP (last menstrual period). But that means that the first two weeks of pregnancy has nothing happening. If you are concerned about development, you don’t start counting at week 3 but start at the time of fertilization, two weeks later. Therefore, the embryological age is generally two weeks later. But remember, we have essentially picked gestational age as the convention for discussing pregnancy dates. If there are markers in development to suggest that the embryological age is different (for example, the fetus is 12 weeks, not 13 weeks), the gestational age is often reported to the mother. In our example, the dating would be changed to 14 weeks. Due to the difference in these dates, we see confusion beyond medical students thinking about this for the first time. It was recently reported that Arizona had changed its abortion law to be the most restrictive – but it hadn’t. It had just joined other states in making the limit 20 weeks gestational age. Remember, this is the accepted convention for pregnancy dating – but many articles picked up on that initial two weeks of nothingness in gestational age and confused it with embryological age. Was this an example of details without understanding of the greater context? Opinions expressed in this piece are those of the author and do not necessarily reflect or conflict with the opinions of DXS editors or contributors. Dr. Catherine Anderson is a Clinical Instructor for the Faculties of Medicine and Dentistry for UBC in Vancouver, Canada. She also leads the Future Science Leaders program, helping teens excel in science and technology. She received her PhD in Medical Genetics and has spent the last 10 years helping people understand the biological sciences: the information and the impact on our lives. You can follow her on Twitter @genegeek.